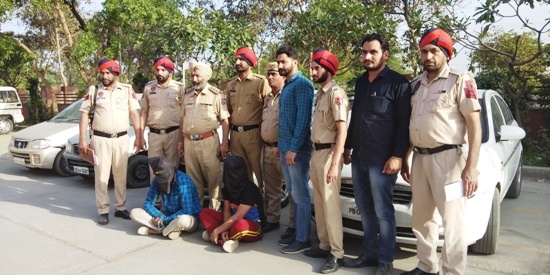 Ferozepur April 15, 2019: Ferozepur police on Monday got the grand success with the arrest of the kingpin of vehicle lifters’ gang and recovered four cars with commercial quantity heroin. 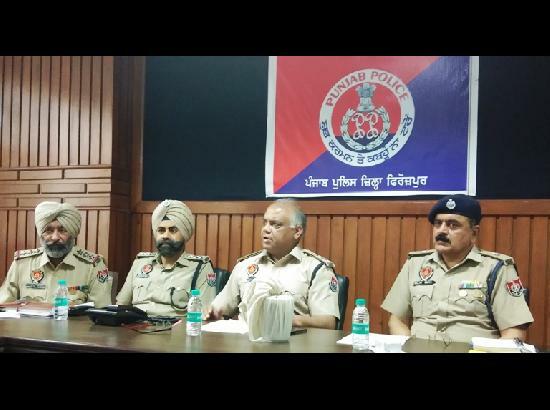 Divulging with more details by holding a press conference, SSP, Ferozepur Sandeep Goel said the police had got some lead following which the kingpin of vehicle lifters’ – Gurinder Singh alias Guri of village Rukan shah Wala with recovery of stolen 2 Alto cars, one I-20 car at pistol point and 270 gm heroin and Jagjit Singh alias Jagna of village Sodhe Wala near Mallanwala with recovery of Verna Car No.PB-04A-0055 from Lohgarh which was used for looting incident on Nov. 15, 2018. Both have been booked uder NDPS Act Sections 21,61,85 and Sections 379, 411 IPC at Arif Ke police station. During the preliminary investigation, it has come on surface that the family of Guri has criminal back ground of drugs business at a large scale and his father is in jail, involved in the double murder case. While the other accused, Jagna used to modify the lifted vehicles for further sale or selling to ‘kabadi’ - junk dealer - after dismantling, said SSP. He further said, the 315 bore country made pistol used in the incident of 2018 for lifting of vehicle at the pistol point, had already been recovered from Gurvinder Singh alias Guri in the case booked under Arms Act at Ferozepur City police station. Guri is already involved in four cases while Jagna in two cases under various sections of IPC and Arms Act at Kulgarhi, Ferozepur City, Arif Ke and PS Dakha police stations. Both the accused are on three days’ police remand and during sustained interrogation, more related facts are likely to come on the surface. On asking about the viral of video of drug addicts, SSP said, the people should come forward to help the police in cracking the drug supplies by informing the police instead of taking the law into their hands. Police have already launched a war against drugs by holding contact progrmmes to spread awareness among village youths at each subdivision level and hope to get positive results within three months period.